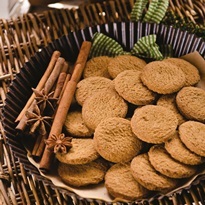 These basic gingersnaps are a pinch more wholesome than the rest, but still quite indulgent. Especially if you opt to top them with the simple lemon glaze. Put the flours, ginger, cinnamon, baking soda, salt, and pepper in a medium bowl and whisk to combine. Put the ½ cup sugar and shortening in a medium mixing bowl. Beat with a hand mixer on medium-high speed until creamed, about 1 to 2 minutes. Add the molasses and egg white and beat for 3 minutes. Add the dry ingredients and stir to combine, or use the mixer on low speed. Don’t over-mix the dough. It should form a soft ball. Place the remaining 2 tablespoons sugar in wide, shallow bowl. Roll about 1 tablespoon of dough into a 1-inch ball. Roll the ball in the sugar to coat, and place it on your prepared baking sheet. Repeat, spacing the dough balls 2 inches apart. With the bottom of a glass, press each ball to flatten them into 1x3-inch disks. Immediately remove the cookies to a wire rack. While the cookies bake, add the powdered sugar and lemon juice to a small bowl, and whisk until smooth. Using the tip of a knife, spread ¼ teaspoon glaze on top of each warm cookie then let them cool completely. Shortening Note: The original recipe uses "dairy-free butter shortening sticks." I believe that means the recipe was created with Crisco Butter Flavor Baking Sticks. But we also like Nutiva or Spectrum for this recipe, which both use sustainable palm oil and are non-hydrogenated.